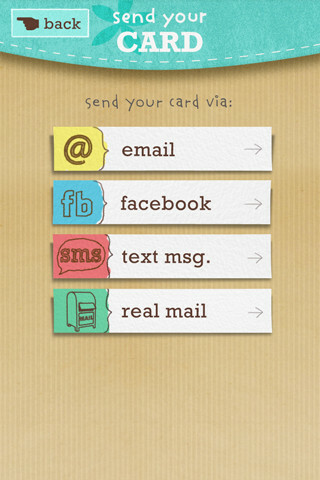 Developer Quote: "justWink lets you personalize and send awesome greeting cards from your phone to your friends, family, and beyond, via REAL MAIL, TXT messages, email or Facebook." - Customize these cards like you can any greeting card: Add your own note, drop in a photo, and even add your own signature (or finger doodle) for that authentic “I Actually Care About You” feel! Sure, there are always Birthdays, but you have other intriguing categories in justWink Greeting Cards such as Just Because, Congrats, Thanks, On The Fly!, Bromance!, Friendship, Couples and much more. Within each category, there are sub-categories. For example, inside of the Thanks group you will find Funny Thanks and Just Thanks. View the cards on a shelf just like in your local store or swipe sideways to see each one at a time. Swipe again to open the card and read the sentiment on the inside. These cards are unique in both graphics and images, not clichéd and can be sweet, flirty and downright funny. The feature I find most unique from other greeting card apps is the way that the cards animate in opening just like a regular paper card would. It's a really special touch. Add your photo or message if you wish, your signature, and you're done! Your card is on its way in a matter of minutes - a relief if you've remembered your friend's birthday too late! 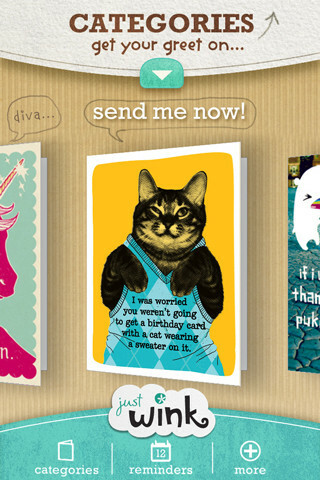 Or use justWink Greeting Cards to post on that someone special's wall in Facebook! In any case, the recipient of your card will be delighted by its charming appearance and personalized content. COOL CONCLUSION: "justWink Greeting Cards makes it easy to send friends a unique and downright special, customized card for every imaginable occasion!" --iOS/Age Rating: This app requires iOS 4.2 or later. Rated 17.